There are three objectives: first to study and document plant productivity and soil fertility changes through time resulting from the implementation of a rotational grazing system; second, to demonstrate a method for keeping grazing records to help in future grazing decisions (timing of grazing periods, herd size, start and end dates); and, third, to demonstrate the Grazing Response Index method of assessing and adapting to current year's grazing management impacts. The first objective is to be achieved through manual forage harvest, plant species data collection, and shallow soil testing. It is necessary to start with baseline data collection so that we have a “before-and-after” comparison. It is necessary to account for temperatures, rainfall, antecedent precipitation (that occurring before the period of observation) and growing degree days, because they affect forage production and soil biological activity. Grazing exclusion cages were set up in early June 2015 in the dry site in Field I at First Street Pasture; photo by Mae Elsinger. First Street Pasture is underlain by a mixture of soil types that affect fertility and water holding capacity. 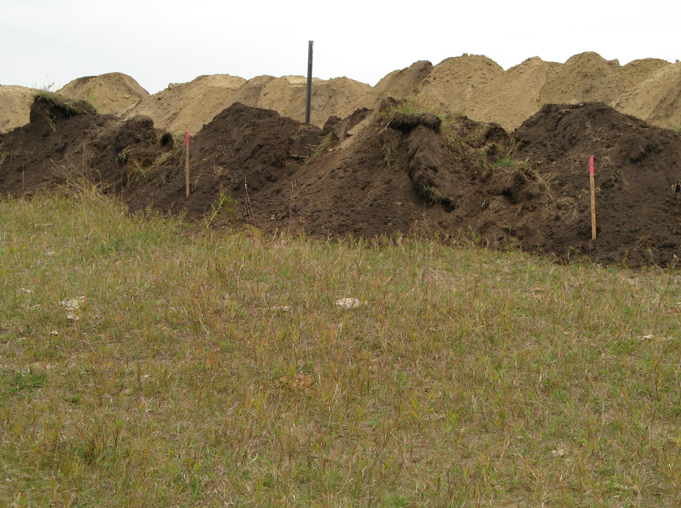 This utility excavation through Field H shows some of the most coarse-textured and infertile upland soils, September 2016; photo by Mae Elsinger. 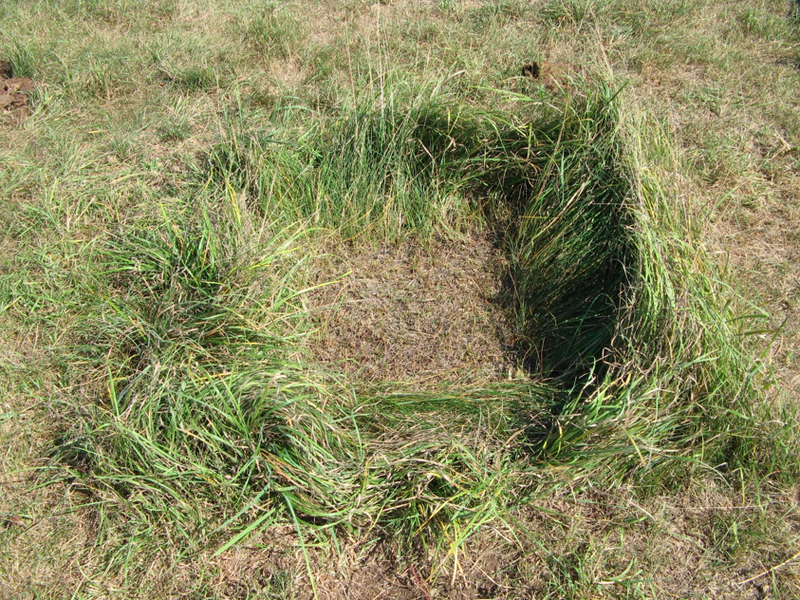 his late September photograph shows how vegetation can be protected by a grazing exclusion cage until biomass is harvested from the center with a 50 x 50 cm sampling frame, September 2013; photo by Mae Elsinger. In the spring of 2015, a 10-field simple rotational grazing system was developed at the First Street Pasture using single-strand interior electric fences and solid posts. The exterior perimeter is a four-strand barbed wire fence with solid posts. A shallow buried PVC pipeline with several spigots provides water to the fields. Fifty cow-calf pairs were rotated through the fields from June to September of 2015, and 50 heifers plus a few cow-calf pairs were rotated in the same months of 2016, with additional days in May. This system was implemented to improve the distribution of livestock use across the landscape, thereby improving efficiency of both forage growth and harvest. Until 2015, some areas of the First Street Pasture had been underutilized, leading to an accumulation of old, weathered forage. Grazing stimulates soil and plant processes and halts the tie-up of nutrients that you may see in decadent forage of ungrazed systems, leading to diminished productivity1. However, we don’t want to defoliate too much forage at one time: in a study in central Alberta2, moderate levels of clipping (4” residual) produced higher total biomass, grass biomass and forb biomass than light or heavy clipping and it produced the highest crude protein yield. 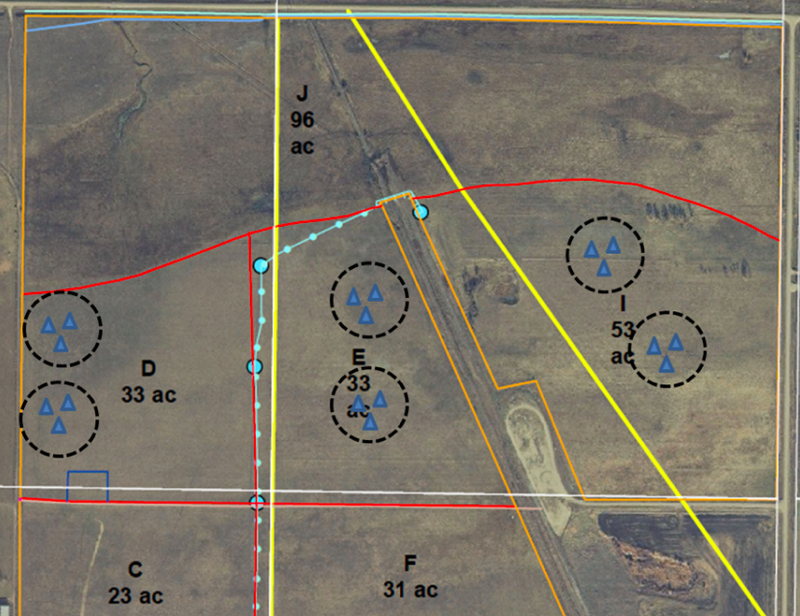 First Street Pasture’s rotational system, with its multiple smaller fields, will confine cattle in areas they normally would not spend enough time in if they had free range over the whole pasture. This is expected to improve the freshness of the grass in all parts of First Street Pasture, resulting in more efficient sunlight capture, better feed quality, and more biological activity in the soil. The rotational system designed for First Street Pasture provides each field a significant period of rest from grazing during the growing season. Effective rest is important because it allows forage plants to regrow leaf material so that they can replenish energy reserves and proceed to reproduce and maintain their existence within the stand. Simple rotational grazing schemes often involve only a single pass through each field during the growing season. Intensive rotational grazing systems take this a step further by dramatically increasing the number of fields (a.k.a. cells or paddocks) with the intent of concentrating livestock onto a smaller area to produce “herd effect” while providing a greater proportion of time for a field to rest after use. The rotational grazing system designed for the First Street Pasture lies in between these two types of rotational grazing strategies. Improving livestock distribution provides better nutrient distribution3, accelerates incorporation of forage biomass into the soil, and promotes more even regrowth of forage4, which in theory can all lead to improved overall forage productivity. However, it is not necessary to adopt an intensive rotational grazing system to improve livestock utilization. This can be done simply by reducing distance to what attracts cattle most – water – either by pasture subdivision and water developments5 or by water development alone6. This is the justification for our simple rotational grazing system and water pipeline. No historical grazing records or forage production data were kept by the previous users of First Street Pasture. Critical components for grazing records include type and class of livestock, and herd entry and exit dates to and from each field. This data allows a person to calculate a standardized level of forage utilization, and to develop an expectation for next year’s grazing capacity (by considering long-term annual grazing report data plus weather information). Without past grazing records from this pasture, it was difficult to know in 2015 how many cattle should be stocked at this pasture for the expected length of the grazing season. Long-term grazing records are helpful in assisting in the development of expectations for grazing capacity of pastures with similar vegetation and soil elsewhere in the province. Grazing Response Index (GRI) will be helpful in explaining any changes to soil health, forage productivity, and pasture health with the implementation of rotational grazing at MBFI First Street Pasture. GRI is the total of ratings for three subcomponents – Frequency, Intensity, and Opportunity – as they pertain to how grazing affects key forage plants. If a positive score is achieved, then the forage plants are expected to have benefitted from the grazing regime7. If negative, they are expected to have been harmed. Better GRI scores are expected for rotational grazing systems for the following reasons: they reduce the amount of time any forage could be grazed, for a better Frequency score, and they increase the amount of time for effective rest, for a better Opportunity score. The amount of forage utilized in a rotational system is under better control, so overgrazing is alleviated in some areas, while greater use is made of formerly underutilized areas Depending on how an intensive rotational system is applied, Intensity can be scored as positive, neutral or negative, but any negative scores are offset by increased Frequency and Opportunity scores, leading to a positive overall score, meaning benefit to the forage stand.